You want wedding theme ideas that will set your wedding apart from the rest. The same old cookie cutter wedding is not the for you. Everyone who attends your wedding will remember your special day for it's originality, beauty and style. But where to begin? If you're not sure exactly how to choose the right wedding theme, keep reading, you'll be well on your way to picking the perfect theme for you. Searching for a Wedding Theme? This is your chance to bring your dream wedding to life. Choosing wedding themes is one of the most delightful aspects of wedding planning if you already have an idea of what you'd like to do, or your'e the creative type. If you don't happen to be so inclined, wedding favors, flowers, centerpieces and even the tablecloths can be hell to review and select. Use a program like Microsoft's OneNote to keep track of your ideas during the brainstorming process. The program allows you to take notes, and add images. This is especially important for the next basic step which is collecting images. Use the simple clip feature, and keep the images in easy to sort categories, for instance,all images for wedding table decorations can go into one folder, and all images for wedding arch decorations would go in another. Run your ideas by a trusted second party like your maid of honor, or another bridesmaid then filter out ideas if need. Finally search vendors on and offline to be sure the items you desire to create your theme will be available to purchase. Some themes can be really hard to shop for, so make it easy on yourself if you can. Wedding theme ideas like Asian, or African themed weddings are based on inspiration from these cultures. You can decide to use colors that are common in art or textiles from that country or use flowers that are native to a particular country or place. 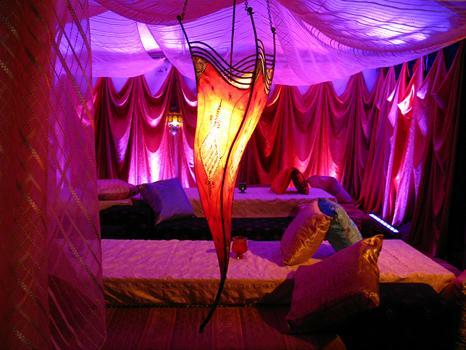 You may want to design your wedding reception to look like the inside of a beautiful Moroccan tent or a French Salon. You are looking for visual cues to make clear what your theme is. There are many ways to express the beauty of a particular culture in your wedding decorations. This will be especially important for you if you are part of a mixed race or mixed culture couple. You may just want to take a few elements of both and create truly unique decorations. Color themes can be based around one particular color in many shades, or many colors used together. Everything doesn't have to match in the traditional sense, but your chosen colors should all compliment each other, and add to the overall wedding theme. A list of color suggestions could go on forever, as there really are no limits to which colors you can blend and match for your wedding decorating ideas. Choices can be narrowed down by looking at the time of year the wedding will take place, the style and color scheme of the venue, the type of flowers you want to use, and types of linens available. Decorations can follow the wedding themes according to season. If you've chosen a season to revolve around, say winter for instance, you can choose flowers like poinsettias, or use evergreen in your wedding reception centerpieces.Ice sculptures make for the perfect centerpiece for a winter theme wedding. It can get expensive, so you can limit this to the wedding couple's table. Suppose your wedding has a Fall theme. Place some sheaves of wheat near the entrance. Place potpourri on the tables. Put some delightfully scented candles in the center and let them bring on the aromas of October. Flower focused wedding themes are a popular option. A vase filled with roses can complement your color scheme, since they're available in white, red, pink or yellow. 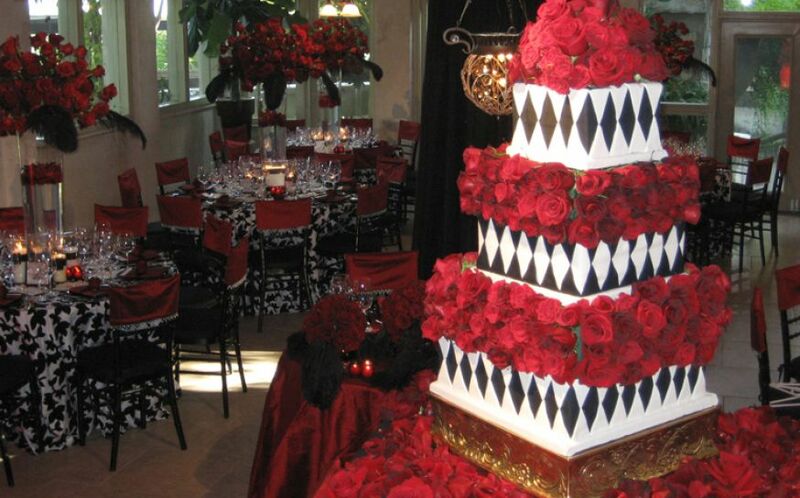 You may want to use all of one color flower, like all white, deep lush red or purple wedding flowers. Floral wedding theme ideas can focus on a particular flower. Of the thousands of possible floral choices everyone seems to have their favorite. 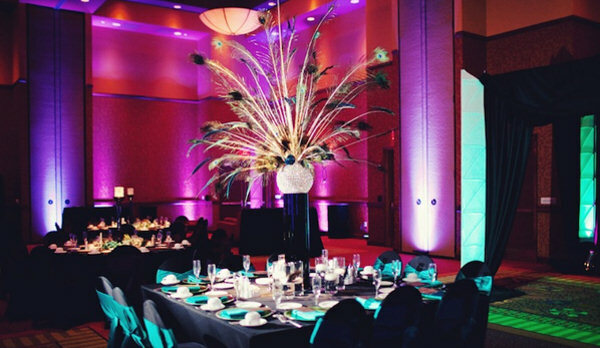 Long stemmed flowers are great for centerpieces and to create focal points at the head of the wedding altar. They can be placed in tall vases near the entrance or at the bottom of the stage where the entertainers perform. 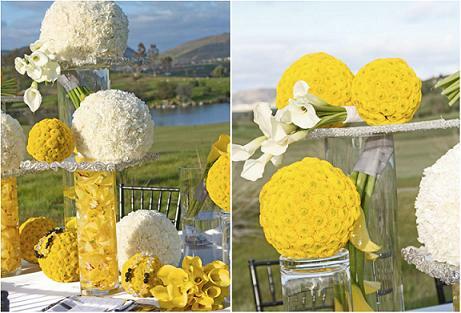 Short flower arrangements make great accents or are great as a centerpiece on their own. They can be used to create pave designs or, they can be clipped and add color to the tables. Consider scattering some tiny crystal spheres around the tables. Their beauty dazzles and enhances your floral arrangements. 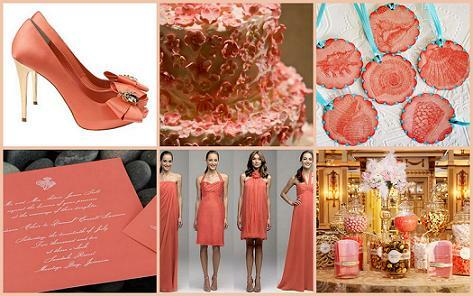 Select the right color, material and elements for the wedding theme ideas of your dreams. Let your creativity flow to the maximum for the big day. You deserve the reward after all the hard work in other areas of wedding planning.